So this is my version of a detox regime. No juice fasts, no diet pills, no starvation stints. 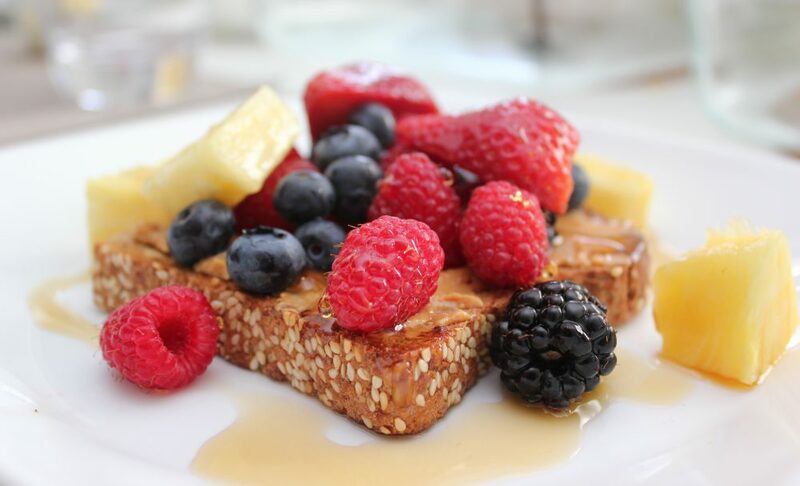 Just good, wholesome food bursting with simple ingredients and fresh, bright flavours. 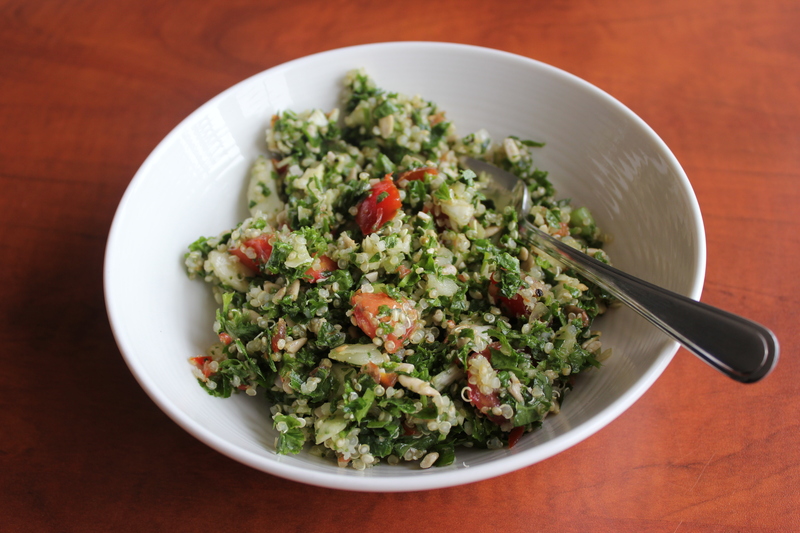 Traditional tabbouleh is made with bulgur, parsley, tomato, onion, garlic, lemon juice and olive oil. Here is my version. Revved up. First add the quinoa to about 5 cups of boiling water. Boil, uncovered for 10-11 minutes. When quinoa is cooked, drain in a fine mesh colander or sieve, rinse well with cold water and let drain well…this might take a few minutes (no watery salad please!). Meanwhile prep the veggies. Here is where a food processor becomes your best friend (although I suppose you could chop the veg finely with a good old knife if need be). Put 2-3 handfuls of kale into the processor at a time and pulse each batch 5-6 times (more or less depending on your model). Repeat this until all the kale is finely chopped (empty the processor contents into a large bowl in between batches). Repeat with the parsley and the fennel and add these to your large bowl. You can add the sunflower seeds whole, but I coarsely chopped them in the food processor. Add the seeds, along with the green onions, tomatoes, lemon juice, olive oil and fresh ground pepper (to taste) to the bowl and mix well. Add the drained quinoa to the rest of the ingredients, mix again and adjust the seasonings (add more lemon juice, olive oil and pepper to your liking). I skipped the salt in this recipe because I didn’t think it needed it. This makes a HUGE bowl of salad. I can’t even estimate the number of servings. But it keeps well in the fridge for a good 4-5 days, although you might have to add a bit more lemon juice and olive oil along the way. Share with your friends, your coworkers, whoever….I also found this to be a great topping for squash soups and such (really! ), wrapped up in a tortilla or pita with some hummus or guacamole, or added to a green salad. 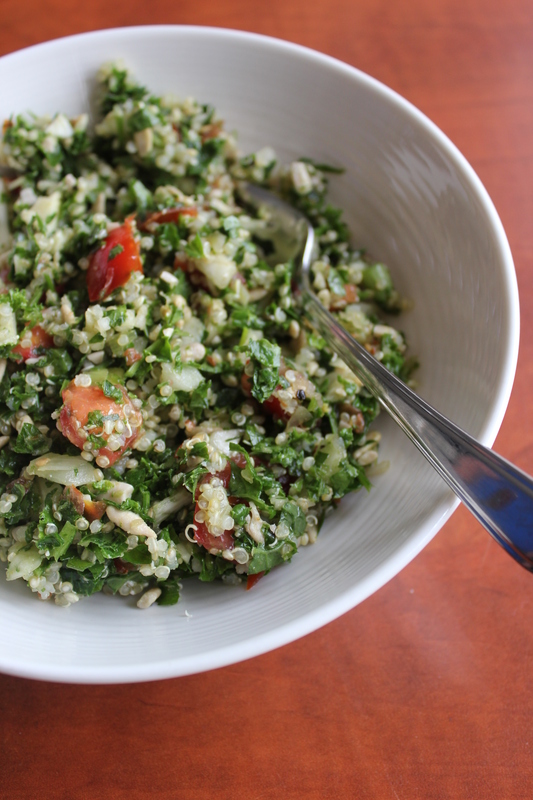 I can’t even begin to tell you the nutrient power this salad packs. Iron, a whole slew of vitamins like A, C, K (might as well throw the whole alphabet in there), fibre, protein, antioxidants, body-oxygenating chlorophyll….this combo has it all! Enjoy and feel the glow from the inside out. You could certainly use fresh lemon juice here but I recently discovered Santa Cruz Organic Lemon Juice. I love it because it doesn’t contain preservatives like other brands of bottled lemon juice…also I don’t run into the problem of having to guiltily toss pitiful, shriveled up citrus fruit that has been languishing in my fruit basket when I forget to use them in time. I keep the kale, parsley and fennel trimmings (provided they’re in good shape) for vegetable stock. I stash these goodies in a freezer bag in the fridge or freezer and keep adding to this “stock” pile….hehehe pun totally intended….until I have enough for stock.